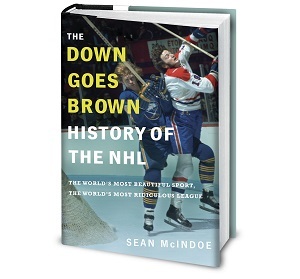 Down Goes Brown: The NHL's concussion lawsuit is here. Now what? That's how long it took for this announcement from a California-based law firm, helpfully accompanied by a delightfully subtle stock photo, to deliver the news: The long-awaited NHL concussion lawsuit has finally arrived. Buckle up; things are probably about to get bumpy. Here's a look at the suit and what it may mean. On Monday, 10 former NHL players filed a class-action lawsuit against the NHL in the U.S. District Court for the District of Columbia. The 47-page suit, which can be read in its entirety here, alleges that the league knew (or should have known) about the dangers posed by concussions and failed to do enough to reduce the risk of head injuries and educate players about the issue. The suit seeks rule changes, medical care for former players, and the "full measure of damages allowed under applicable law." There's no dollar value attached to that yet, but in theory it could be very high, well into the hundreds of millions. Is this basically the NHL's version of the recent NFL suit? It could be, though we're not there yet. There are certainly similarities between the NHL's situation and the recent NFL case. Both leagues have been plagued by player concussions, both have made recent rule changes to try to reduce them, and both have struggled with the question of how to make the games safer without rendering the sport unrecognizable to fans. For whatever it's worth, attorney Mel Owens, who is involved in the NHL suit, is a former NFL linebacker. The specifics of this particular suit weren't known until Monday. But once the NFL litigation began, the clock was ticking on the NHL to face something similar. It has long been seen as inevitable that the league was going to be hit with a massive class-action suit over concussions at some point.